A common concern among vegans is how to eat a lot of protein and still remain faithful to the diet. 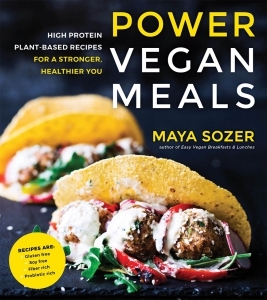 Maya Sozer, private chef and author of the popular Page Street bestseller Easy Vegan Breakfasts and Lunches, will show you how to get the calories and protein you need to keep full and energised throughout the day. Maintaining a healthy and athletic lifestyle like Maya can be challenging, but the key to success is proper nutrition. With Power Vegan Meals you are covered for breakfast, lunch and dinner. Recipes include Golden Turmeric Smoothie, Buff Burger, Sri Lankan Red Lentil Curry, Tuscan Bean & Veggie Soup and One-Pot Red Lentil Chili. Veteran vegans, as well as those who are new to the diet, will appreciate the diverse flavours and recipes that pack in the nutrition without taking too long to prepare. Maya Sozer, co-founder of Dreamy Leaf, has over 71k Instagram followers and has been featured in Thrive magazine and the Huffington Post. This book will have 75 recipes and 75 photographs.